This is part 5 (final post) of the Los Angeles Eating Adventures Series. The other posts in this series include Peking Restaurant, Scoops Westside, Sushi Zo, and Bouchon Bakery Beverly Hills. Who or what is Samm? Samm is a dining room inside José Andrés’ main restaurant in Los Angeles, Bazaar. Samm only offers a tasting menu which highlights Jose Andres’ best or favorite dishes from his various different restaurants. Think of it as a “greatest hits” plus some hidden favorites only available at Samm. José Andrés is best known for introducing the tapas concept to America through his many Spanish-influenced restaurants in the US. He trained under the molecular gastronomy king Ferran Adria at El Bulli, whose influence you can definitely see in his dishes today. After a chilly walk around Beverly Hills (where I visited the only Bouchon in Los Angeles), we headed to Samm, anxious to see what surprises José Andrés had in store for us. The only way into Samm is through Bazaar, the main restaurant inside the SLS Hotel a few miles from the famous Rodeo Drive. Meander on inside, past the sweets shop and the interesting museum-like items, to arrive at a door deep inside the restaurant. Step inside, and a calm, warm oasis away from the flurry of activity outside greets you. 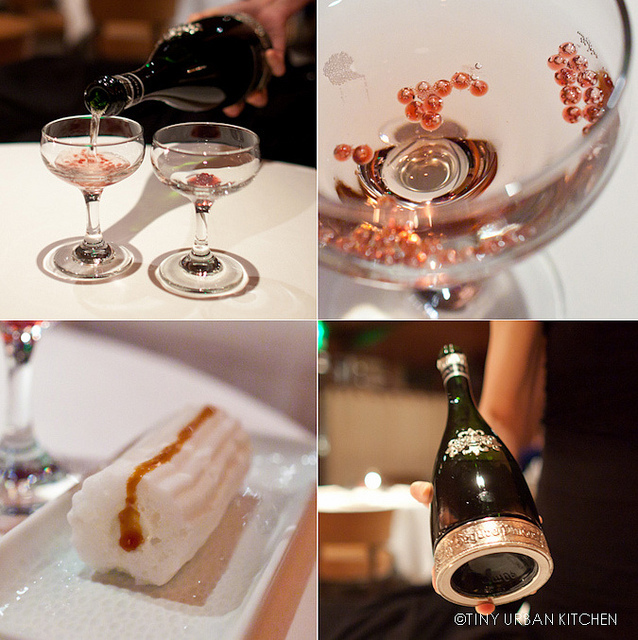 We start with a most interesting interpretation of the Kir Royale, a cocktail traditionally made with champagne and creme de cassise (black currant liqueur). In this case, the creme de cassise is trapped inside these small, caviar-like bubbles and thrown into a glass of cava. Although they start at the bottom of the glass, the pressure from the gas bubbles slowly lifts the bubbles within minutes of the pour. It’s a beautiful site to watch. We enjoy our whimsical drink with an apple blue cheese meringue topped with a hazelnut sauce of sorts. The texture of the meringue is super airy, almost like you are eating a really light styrofoam. At the same time, it has a strong blue cheese component, which works surprisingly well with the bright, fruity apple flavor. The next course arrives on a wrinkled tissue paper. Two small seabeans are coated with coconut powder and fried to resemble tempura. A thick tamarind reduction is drizzled on top. This turns out to be one of my least favorite courses of the night. The beans are overall too greasy and nothing like the ethereal 2-star Michelin tempura I had in Japan. Maybe they fried it too long or at too low heat? The beans have a heavy flavor of the sea, and are quite dense. The next dish more than makes up for my disappointment in the seabeans. Do these “ice cream cones” look familiar? Of course! The salmon cornets from Thomas Keller! 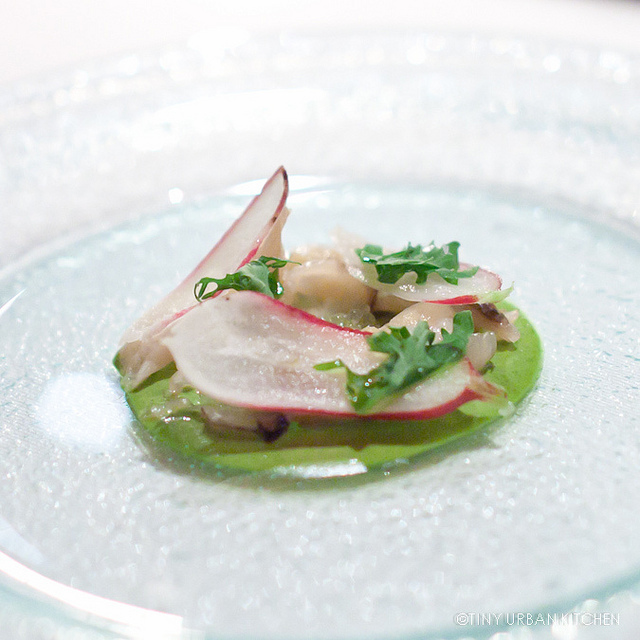 José Andrés’ version is made with raw tuna, wasabi, avocado, and cilantro. There is actually nori (seaweed) inside. All the flavors in this little bite come together beautifully, and I wish I had more than just one. Another winner! This oyster is paired with jamon, the famous cured ham from Spain. The salty, briny taste of the oyster is nicely offset by the bright citrus notes. You know when a dish is named after the chef, it must be one of his all time favorites. This next course is outstanding. Imagine: Iberico consommé gelee, Spanish sturgeon caviar from the Rio Frio region, and mini droplets of artichoke purée on the side. Iberico consomme is a stock made from jamon iberico, prized pigs from Spain who are fed acorns (I’ve raved about them several times on this blog already). This deep, rich, ham-like stock is warm and full of depth. Of course the caviar is fantastic, and the artichokes add a nice contrast to the strong, salty flavors. Interestingly, this particular course is paired with a wheat beer specifically designed to be paired with food. Feran Adria and an Australian beer maker collaborated to design food-friendly beers. The next course is interesting, arriving on a ripped paper bag. It is based on a basic Spanish street food – fries in tomato sauce. José Andrés has re-invented this street classic by deep frying potato souffle with tomato sauce on the inside. This largish single “fry” is topped with and paprika and aioli. The flavors for this “street snack” are fantastic. Even though the dish is cold, the “bravas” still has a super thin crispy exterior with a very flavorful tomato sauce inside. I love the strong, spicy paprika, which adds a nice kick to the entire course. “Cigala” is a Spanish term that refers to a Norwegian lobster. In this dish, a paper thin crispy chicken skin is topped with Norwegian lobster and parsley air. Although the textures are unique, the flavors of the lobster and chicken skin are more normal, though still quite tasty. The parsley “air” (a foam of sorts) does add an interesting twist and helps to cut the rich fattiness from the lobster and the chicken skin. I hadn’t ordered a pairing for this meal, but this was a dish the I felt could have paired well with something light and crispy to offset the richness. This next dish definitely takes full advantage of molecular gastronomy techniques. The Mozzarella ball is actually made using via a method called spherification. It oozes out mozzarella liquid, which is absolutely delicious. This is served with cherry tomatoes, a gorgeous pesto, and some pillow shaped crackers. Another excellent course, this “crispy nigiri” takes a slice of yellow jack tuna and places it over crisp puff rice and celery root purée. It is topped with pickled turnip and fresh yuzu zest. This bite is delicious and I like the strong celery component as well as the texture of the crunch from the crisp rice. This next course is probably our favorite dish of the entire meal. The risotto consists of Spanish rice (maybe Calasparra rice?) cooked in a to-die-for uni and eel broth (plus vermouth!). This rich, velvety, risotto is topped with fresh uni, grilled strawberries (a la plancha as they say in Spanish), wasabi, and black garlic. Surprisingly, the strawberry works really well in this dish! The entire dish is creamy, al dente, and super flavorful. We are both super sad when we finish the bowl, and more than once we gaze enviously at other guests when they receive their bowl of uni + eel. “Chipirone” is a small squid common in Spanish cuisine. In this case, squid is grilled and served with artichoke purée, an artichoke chip, baby spinach, and cippolini onions. This is served at room temperature and I thought it was fine, but nothing particularly special. “Banh Mi” is traditionally a Vietnamese sandwich made with cold cuts and pickled vegetables inside of a French baguette. José Andrés makes his with a deep fried steamed bread (sort of like a Chinese manto). The interior? Wagyu beef, fried tofu, pickled carrots, daikon, cilantro, and aioli. I personally think the fried bread is too greasy and some of the flavors are a little too overpowering. The pickled vegetables are too strong and the fluffy fried bun just isn’t substantial enough to stand up to the strong ingredients on the inside. Although it is a nice concept, I think the traditional banh mi actually tastes better! Carrots are the theme of the next dish, where even the plate is painted with orange carrot “paint”. There are boiled carrots on the side, bay scallops dipped in carrot paint, as well as shaved red carrots on top! There is a hint of sesame oil flavor, and the dish is also served with black sesame praline. “Mirugai” is the Japanese term for geoduck, a seafood with which I have a love/hate relationship. The first few times I tried it in America, I thought it had this awful stinky odor that I didn’t really like. Then I experienced it in Japan at high-end sushi restaurants, where it tasted fresh and delicious. Here, the geoduck, which is served with radish and an herb oyster purée, is again fish and stinky. 🙁 I guess I only like really fresh geoduck from Japan. This next course comes with the option of shaved white truffles. I’m usually too cheap to go for such luxury extravagances, but Bryan is always excited and willing to try new things. My wagyu beef is well executed but kind of boring. It has traditional French flavors from the mushrooms, but it does not strike me as anything particularly creative. Bryan’s dish with the white truffles tastes (not surprisingly) better than mine. The white truffles add a nice, aromatic and creamy element that enhances the entire dish. I am still disappointed that the white truffles only made an average dish better, not elevated an amazing dish to new heights. Bryan and I have very differing opinions on this next course! First off, keep in mind that I don’t really like the taste of liver, and I only like fois gras if it’s prepared really exceptionally. Bryan, on the other hand, just loves fois gras and liver in general. Candycap mushrooms (which are beautifully aromatic with almost a sweet scent – hence the name) and fois gras are cooked in a plastic bag which is cut open tableside. I really did not like this dish. Most of the fat from the fois gras had melted, creating this thick layer of oil on top of the dish. What remained of the fois gras tasted much more like boiled liver, its fat stripped and melted. In my mind I kept thinking “what a waste of white truffles”. I couldn’t finish it. Bryan thought I was being way too harsh on the dish. He thought the fois gras was still quite enjoyable and the overall flavors were very nice. He did concede that boiled fois gras is not the best way to go, and that he also prefers it seared. The next course is almost like a palate cleanser (after all that richness!). It consisted of baby peaches that are picked before the pit has formed, burrata, Z’atar spices, brioche croutons, and hazelnuts. Although the overall dish feels just a bit rich (perhaps I need something even more stark after all that fois gras fat! ), the flavors are pretty good. For the longest time we have no idea what this next course was. They bring over a huge metal bowl with nothing inside. Then, they carry over a jug of liquid nitrogen and two puffed corn cakes. Sambuca is an Italian, anise-flavored liqueur. This particular sambuca flavored ice cream also has compressed green apples, fennel gelee (related to the star anise), and a candied burnt shell on the bottom. I enjoy the fruity and light nature of this dessert, and I’m always a huge fan of anything candied and burnt! The chocolate rock, which contains many porous holes like lavarock, is made by dropping chocolate into liquid nitrogen. This is served with lime yogurt and some sort of brioche. It’s interesting to try such a long, varied, and drawn out meal because you really get to see so many different aspect of José Andrés’ cooking. I was especially impressed with some of the earlier dishes in the tasting, which I thought exhibited a lot of creativity and strong execution. Some of my favorites were the Jose’s Combination, Patatas Bravas, Not Your Everyday Caprese, and the Uni and Eel. My least favorite dishes were the two meatier courses that came with white truffles. I remember even muttering to Bryan that I thought José Andrés should just stick to Spanish food and molecular gastronomy because his French-like offerings were noticeably weaker. After getting a tour of the kitchen, we learned that my two least favorite dishes had actually been designed by one of the chef de cuisines at the restaurant, not José Andrés (though he did approve them for the restaurant). All in all, the whole meal was a fascinating experience and I still enjoyed most of the meal. I wouldn’t recommend splurging for the white truffle option here. Save your money and get it at a restaurant that will blow you away with it (or buy your own and cook a fabulous meal!). The price for the tasting, which includes 20 courses, is $120/person, which is not that bad considering the crazy amount of work that goes into each meal. Compare that with other chef’s tasting menus like The French Laundry ($250/per person), Per Se ($275/person), or Joel Robuchon (a whopping $385/per person). Of course, there are plenty of amazing chef’s tasting menus in the lower $100’s range. Some of my favorites that come to mind include Momofuku Ko, Menton, and L’Atelier de Joel Robuchon (post coming soon!). If you don’t quite feel like shelling out over $100 for a meal, you can always go to Bazaar, where you can order some of these dishes a la carte, such as the Banh Mi and the Not Your Average Caprese. I have such a chef crush on Jose Andres – I’m SO jealous you got to eat that food. Patatas bravas is one of my favorite dishes ever, and his version look insanely good. I enjoy reading your blog very much. Your food knowledge and passion are great! Very good job. By the way I believe he uses olive oil to fry the food. That is problem. Good tempura restaurant use very special sesame oil (good for high-heat, but very expensive) in Japan. Geoduck available in the U.S is huge (normally one is about more than one pound), slimy and fishy. Japanese Mirugai is small and clean taste, and texture is a little firmer than scallop, right?